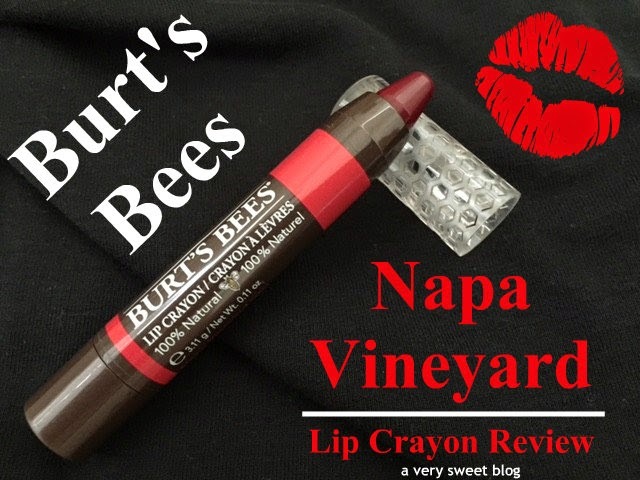 I received a full-size sample of Burt's Bees Lip Crayon in Napa Vineyard (435) for review and I am very impressed. Everything about this lip crayon is fabulous. The color is super rich. It's moisturizing. It gives off a nice shine, without being too glossy. I literally sang "Red, Red Wine" (UB40), as I was applying it to my lips. HaHaHa Wear time is hours, with normal transfer when eating and/or drinking. For best results, make sure you exfoliate and moisturize your lips. This deep color will show up any chapping. The only suggestion I would give to Burt's Bees, is to make more colors. Right now there are 6 beautiful shades to choose from. I also give Burt's Bees thumbs up for packaging. 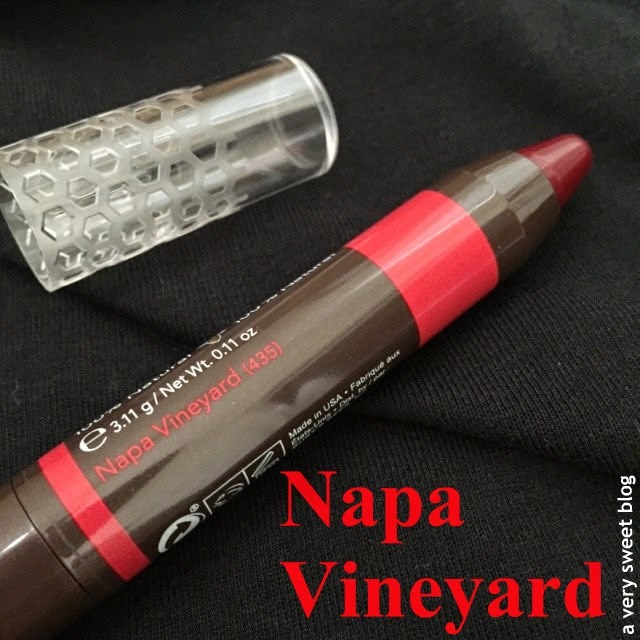 The honeycomb cap is ingenious and I love the fact that you can raise the lip crayon up or down by twisting the bottom. 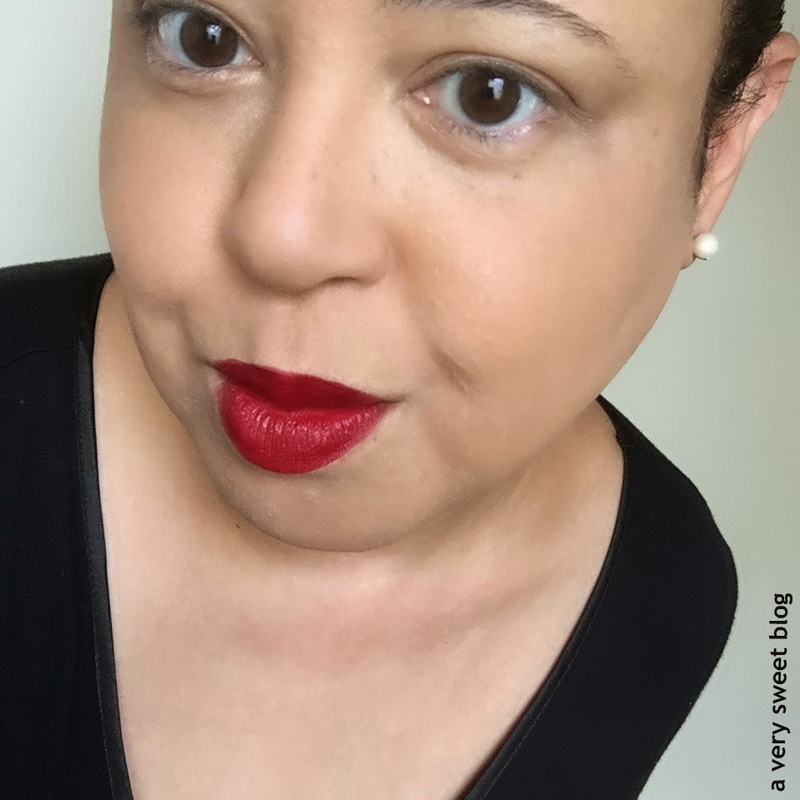 I created a 45 second video for you, so you could see the shine, creaminess, and texture of this lip crayon. Sorry for the bright overlay, I was playing with filters and forgot to remove it before processing. I'm currently experimenting with YouTube videos. I've had a channel for awhile, but never used it. I may start doing video snippets, like the video below to give you a closer look at products. No promises, but I'll see. The colour looks great! I like Burt Bee's products, always good! What Burt Bee came out with cool lip pencil like this that color is stunning on you and I agree will love for them to have more colors. Have a lovely weekend. I'm definitely going to look for this next time I'm at the pharmacy. I love Burt's Bees lip balm. Color is a total bonus. That wine color is gorgeous on you! You got me interested in Burt's Bee lip products again Kim. 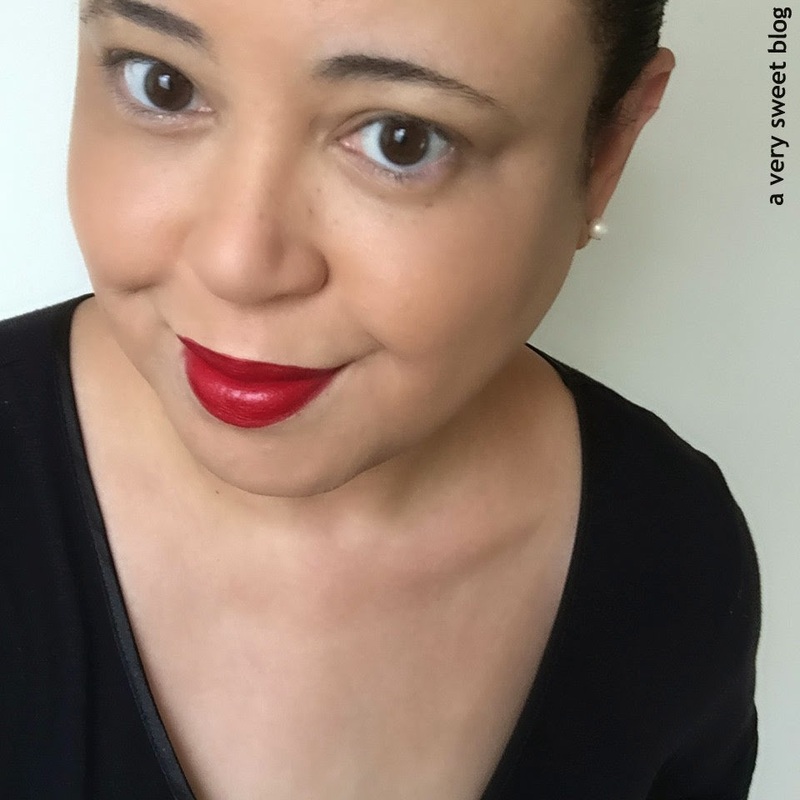 I used to try the lip balms and some other things but not quite whether i liked them or not. That color is rich and beautiful (and you are adorable in the video). Is it very moisturized? My lips are really dry and hopeless. More videos please. That color is gorgeous on you Kim! I haven't been keeping up with Burt's Bees and really need to check out their makeup range. The packaging on this crayon look awesome. 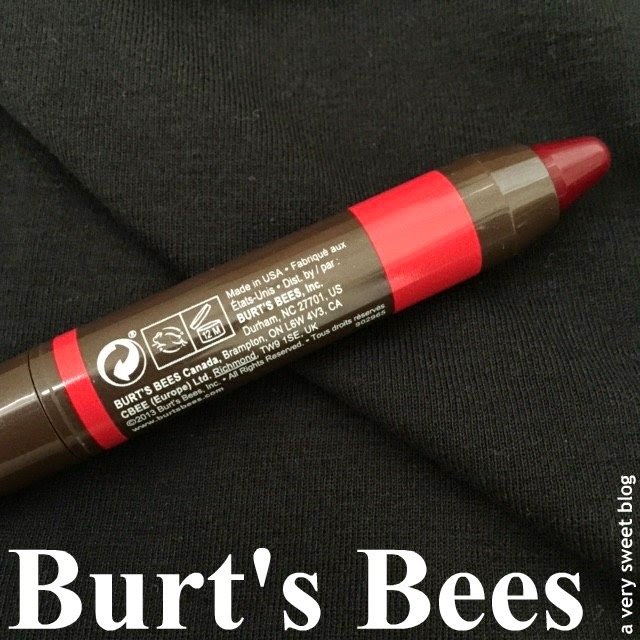 I have one of this lip crayon from Burt's Bees but in a different red shade! I do really love this shade on you, definitely must pick it up for myself. And thank you for a video, Kim and I do look forward to more! I have been using Burt'a Bee products for as long as i can remember and i love them. Quality stuff and it works. Now this is just too cute. I agree, more colors would be fun. This just looks so awesome on you, Kim! I agree with Rowena...haven't kept up with what the line has been up to, but will check this out now! I love the little video you made Kim!! I hope you make more! And that color is stunning on you! I do love the honeycomb cap it came with, such a cute little detail! I need to try these out. I like the video! And I've been wondering about those lip crayons! I have the chopsticks that have colors from them, but like you said: exfoliate! for that one too! PS if you decide to do a channel, that would be great to see your review there too! Hi Kim! I love that video. Very cute! Would love to hear your voice again! You wear dark colours very well. :) I don't usually buy lip crayons, but these look fantastic. Btw, I'm reading "Elvis and Me" and I'm addicted to it, just started the first 15 pages though. I bought it cause of your review from last year. Okay, talk to you later! Gorgeous color!! I love the name and the honeycomb cap is way too cute!! Hi Kim, well done, I love this post and now video! I love that you can see the product and love the music! I am definitely going to buy this lipstick! Thanks for the review! Enjoy the weekend! Awesome review. I really like how pigmented the crayon is and am actually a little bit surprised. I saw this in the store earlier today and thought about trying it so I'm happy I came across this post! Thanks!! Wow, looks great on you! It looks like a real lipstick plus the moisturizing effect. I will definitely try this. We have a campaign for this product here in Toronto. I definitely want to try this product out now! 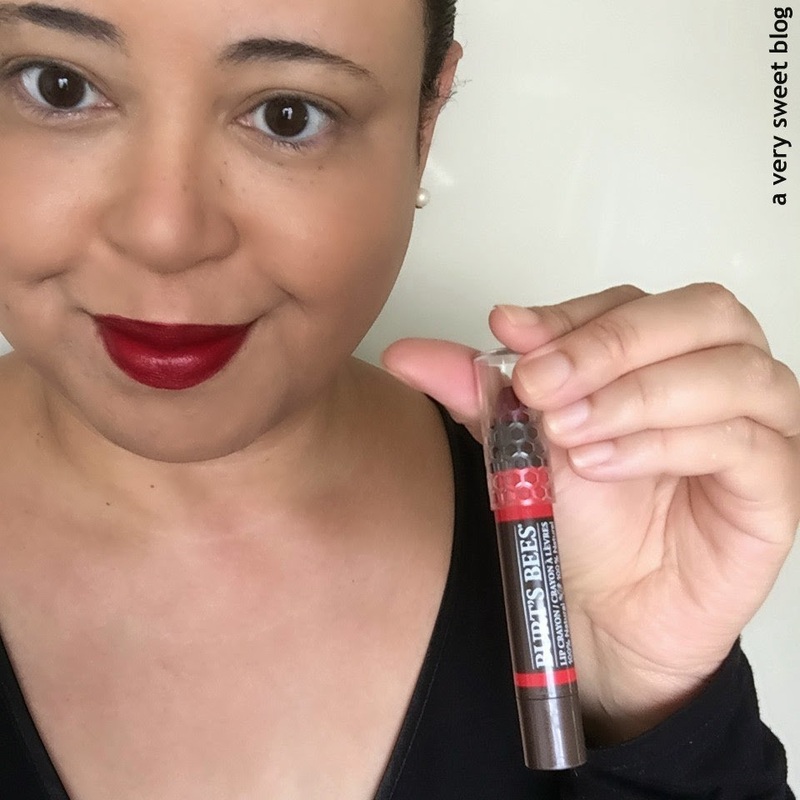 Thanks for the review :) I've been loving lip crayons lately, so I'll definitely need to pick one of these up this weekend! Wow, Kim! Well done, dear! Your video turns great... I wouldn't be brave enough to do one.. Haha! Maybe one day! ;-) Using Burt Bee's every now and then too btw! This color looks gorgeous on you Kim! I just subscribed to your channel. I like the idea of showing products on videos! I was thinking of making youtube videos myself but I don't know anything about editing so I'm nervous. I love bees, especially honey bees. I even find the big bumble bees super cute. Bees are crucial to the ecology of this planet so I really appreciate the fact that Burt's Bees supports bee conservation projects. Next time I'm in the drugstore I'll have to look out for these. I think it is awesome too that you don't have to sharpen them. You look GORGEOUS in that shade! It's vampy, but elegant. I never knew Burt's bees made these lip crayons and would try it out! 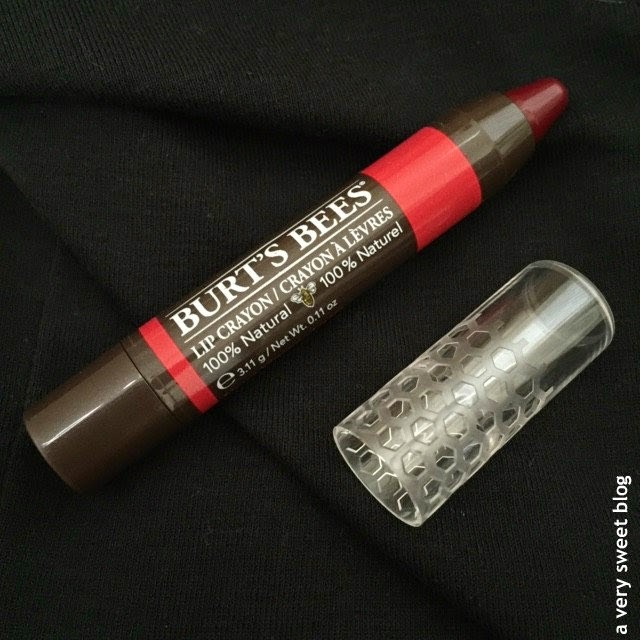 Although I have tried several Burts Bees products and I love them… I have no tried anything with colour so its great to know they are as good as the rest of their lines. I recently saw the real Burt documentary and it was quite insightful. ooh, that's a pretty color. looks very pigmented and smooth. good to know...thanks! !